Interview with Peggy Frank about Ecological Reserves . This interview was videographed at Peggy Frank’s house on November 23rd 2011 by Ray Painchaud. Peggy Frank was an early organizer of Friends of Ecological Reserves and a past-President. Mike Fenger (MF) I am here with Peggy Frank a former President and volunteer for Friends of Ecological Reserves (FER). We want to learn Peggy’s story and hear about the early days of ERs and of FER. First we want to find what drew Peggy to conservation. Peggy Frank (PF). How did I get interested in the environment – that is a hard one. I did an under graduate degree in marine biology and I came out to the coast immediately when I finished as I wanted to see the Pacific Ocean. Once I got here I started exploring. I was really lucky – although my degree was in marine biology I ended up not working in that area. I realized quite quickly that with a Bachelor’s degree in marine biology I would be working in the lab. I didn’t like working inside at all, so I stopped doing that and started illustrating. I ended up illustrating wild plants in the forest for the Ministry of Forests for a number of years. I remember meeting people like Jim Pojar. I was, in fact, illustrating for Vladimir Krajina. He was writing on a book on biogeoclimatic zones and their placement within the forest. I don’t know if he ever finished the book but I did plenty of illustrations for the Ministry of Forests – that was a lot of fun and was my introduction to conservation in BC. MF Can you go back even earlier. You left Ontario with a degree, but let us go back earlier than that to find out what hooked you into wanting to work in the environment and in conservation? PF – I can remember my dad used to take us to the country – to the woods near Montreal – we lived south of Ottawa – on a river – had a rowboat and we used to meander through the woods nearby. We had none of 5 o’clock is dance class and 6 o’clock is music – we had none of that. Lots of unscheduled play time and we would go off on adventures. I soon realized that I preferred being outdoors to being indoors. I loved the way that I felt when I was outside – for me it was a spiritual. And I did not find a lot of people like that when I was at high school. It wasn’t until I was at University – University of Guelph – that I met people who liked to hike, canoe and do all the things that I loved to do. So I finally had a group of friends who were interested in exploring and finding out what was where, and all the rest of it. I didn’t really have that much knowledge until I came to BC. It was interesting – I knew my marine biology – had memorized goodness knows how many invertebrate species, but I just didn’t know that much about the terrestrial ecosystems and the forest. MF You were there in the very early days when people were first thinking of ERs. Tells us about your work with Vladmir Krajina? He was really a key person who promoted the idea and who had the energy to really get ERs started. MF. How did you become aware of or involved with into Friends of ERs? PF – The ER unit was already formed at that time and I had friends like Bristol Foster, Lynne Milnes and Trudy Chatwin, who were working for the unit. I guess it was when I was working as an illustrator and Lynne was working as a native plant gardener at the museum that we became really close friends. I used to spend hours down there in the native plant garden. The museum – right in the heart of Victoria – had a whole bunch of native species that I could draw. Lynne and I talked a lot about her job as the warden coordinator and we realized that the wardens needed support once the unit was folded. So Friends partly formed to support the wardens, as we realized immediately that they were the eyes and ears of the ER system. We could have a whole network of ERs and they would be completely destroyed without eyes and ears on the ground. So supporting the wardens was really critical to what had to happen – since the government wasn’t going to do it, we formed the Friends. Trudy, Lynne, Vicki and I (I think) were involved in the early days. We spontaneously put together newsletters – sat around in someone’s dining room with the materials that we had. Fortunately there were computers because it would have been a lot harder without them. In the early 1980s we were a tight group. Mary Rannie who is still with FER was also part of the original FER. MF So tell us how you ended up as President of FER? PF – It took a long time – I never felt that I knew enough to be president. I just came in as president because we needed someone to be president. I don’ think it was because of my incredible skill set, but when I was president I really enjoyed it. I liked getting in touch with people from across the province and seeing their dedication – the commitment that the wardens had for the ERs was amazing. It was their ER – there was a real pride – they were watching over their ER. MF I think you were instrumental in a big meeting with the wardens. Can you reminisce a little on how that came about? PF – Initially, when Lynne was working for the ER unit, there was an annual wardens meeting. It was such a good time for them to exchange information. What they found out about each ER, and how they deal with this problem or that problem, and what great things that they found -just a great moral building thing – those meetings. When the government closed the unit there was no money for the meetings for quite a while. Then we went to the Ministry of Environment and asked if we could get some money for holding a meeting. The answer was YES! We had this gathering of wardens in Kamloops – it was wonderful just to get people together and see the enthusiasm that didn’t die after 20 years. I think we gave 6 people recognition of working in the ERs for that long – no pins – just a certificate. It was pretty amazing. We went for a wonderful tour of the ERs in the area – which we always do when we can. We used to go at least once a year off on adventures to see ERs. On Vancouver Island we still go out to Rack Rocks and see what the Pearson College students are doing. WE also went to visit some of the ERs that were more remote – on the west coast of Vancouver Island. It was a really big part of Friends to understand the reserves that we were talking about and go with the wardens to see them. MF At that time was there research funding available that FER could provide to researchers? PF – Friends of Ecological Reserves had very little money ever. We had an annual budget of $20,000 – it was pretty minimal. We had some incredible research done by supporting researchers that were often in the University system. I remember we gave some money for a really important study tofind out how many intact watersheds there were on Vancouver Island. MF Was before Keith Moore’s study? PF – Yes that was Keith’s study. It was amazing to see how little was left at that time. I think his work was instrumental in saving places like the Carmanah watershed, and the beautiful areas around Tofino. There are lots of reserves that would not have been saved if we had not done that research funding. I think we had a lot of respect from the government because of the quality of research. For years we funded Tom Reimchen’s work. He certainly has an ability to weave ecosystems together. Tom’s research on stickle-back fish was partly funded by FERs. There were researchers who were looking at burrowing owls, researcher looking at marbled murrelets – all partly funded by FERs. Also it would be enough for a scientist to get a thousand dollars from FERs to leverage other funds. Jane Watson and the sea otter studies were funded partly by FER for years. Lots of good research! MF Do you have advice for FER on how to get research funds today. Research in ecological reserves is something that they are set up for. We would like to get more ER research. How did those funds come to FER? PF – We had donors who gave us large sums, and we had bequests at times. I think the way that we worked with universities was really important. We weren’t funding the researchers solely – it was often just a little bit of money so they could get the boat and the gas they needed to do the research on the water or to get money to buy food to do a field trip to an ER. It wasn’t a lot of money but sometimes it was the difference for someone as to whether they could afford to go or not. I guess the best advice that I have is to stay connected to the universities and there are plenty of them now more that there were and to see if there are researcher who want to go out and do incredible research. There are lots of good research opportunities. MF. What could government do to make research a little bit easier in ERs? PF – I think we can easily train people who have some science background – who have a huge interest natural history – to do some monitoring research. The ER wardens are ideally placed to do that – want to in a lot of cases. There is a huge discrepancy of opinions on whether you can train a lay-person to do that kind of research or not. I just think that it is good to have somebody monitoring things – even if someone comes in and shows the warden where the Macoum’s meadow foam is – and then the warden goes back and measures the size of the colony. That would be some important information to have over time. One of the things that I remember from the days that I was illustrating is that I went into the grasslands in BC – there were these fenced areas that had been studied for 30 years – those long range studies are hard to do unless you have wardens who have been going to an ER for over 20 years. So I think using wardens effectively is really important. That would be a very good investment of government money to train them to do some basic research. MF I wanted to ask you about some fond memories – you brought out some pictures. PF – I remember we would go to see the wardens and we might go to Lasqueti Island and Jedediah – head to Bamfield and try to get into the ER that is on the shore of Nitnat Lake. It was so wonderful – the wardens would be there to greet us – boat us into the ER. There were lots of wonderful adventures and the freedom to go and explore. Then sometime around 2003 we went up to the Spatsizi area – I had always wanted to see it. It was one of those dots on the map – you wonder if you will ever get there. The area is really hard to get to – we had to fly or hike for a couple of days. We choose to fly into Coldwater Lake on the edge of the Gladys Lake ER. I wasn’t so well at the time so I did some lower level hiking, but some people went all the way around the Reserve. We had a wonderful time just going up little trails – seeing what was on the ground – what was there in this massive ER. Flying in – it was very beautiful too – you see how diverse the area is. I feel like I will never see BC – there is just too much different countryside to see. 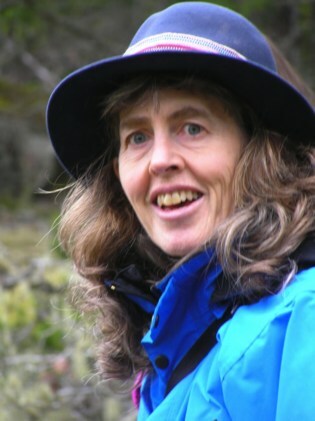 I did a silent auction item for a fund-raiser – they auctioned off a marine walk with Peggy Frank on Thetis Island. With another friend, who is a much better marine biologist, we walked for over 2 hours, about 100 yards, because there is so much to see in an area if you are really looking on the ground. So BC offers so much opportunity for research, or people who just want to see the natural history of an area. MF I wanted to ask you about some of the challenges that might still be here today or the biggest challenges that you can remember being part of FER? PF. One of the biggest challenges is the colour of my hair and your hair. We are not alone in our love of nature and this commitment to this beautiful province of ours. What we have not been brilliant at is bringing young people in to work with FERs and to work on ERs. That has to happen for things to stay in a state that seems reasonable to me, and to stop development from overtaking the whole of the province. MF So the challenge for us today is getting a more even demographic in organizations like FER? PF. Yes that is exactly what I am saying. MF What about some of the challenges for government for managing ERs. How could government make some changes to improve the lot of ERs? PF. I think it wasn’t a good idea to disband the unit. So I think to create a management unit that would maybe have one arm of which was focusing on ERs, and another on ecological management within development projects. So if a development project goes ahead in an area that is vulnerable (and we have tons of them) there is an ecological committee that could help them mitigate the ecological effects of the development. Then have another arm that is associated with Parks where other kinds of ecological input is needed. Sometimes we can dream in Technicolor, but if government does not have that as a priority, then it is not going to happen. It just seems crazy to me – for what we pay wardens (nothing) and what we get from them (plenty) – the whole idea that you have some people scattered around the province that are doing some really good things to protect ecosystems. Supporting them in some small way with one headquarters person seems a very small investment – very little money to get huge benefits. MF I am wondering if you have any thoughts on the ERs system. ERs were set up to be representative and for unique plants and animals and if you have any thoughts on the completeness of the system. If it isn’t complete is it possible to add ERs? Expanding the system is a role for FER or a role for government? PF. I think what happened was when the NDP government was in power they did an incredible thing – they did save 12% of the province – it is really hard to move beyond that right now. So I think that within that 12% we have to manage what is protected – unless there is a particular area that changes over time to become more or less critical. We are sitting in Victoria in a really rare ecological system. The Mediterranean climate that we have here – the species that grow here – the human density that we have in this area. There is a need for more ERs here – I am sure and it has a lot to do with protecting areas from development as development progresses. It is a moving target – you cannot say today that we have protected everything that we need to protect. The mountain pine beetle has complete decimated areas that we set aside to protect pine. A changing world creates the need to change our priorities. Is there another pine stand somewhere that has not been affected that could be protected? My focus has shifted from ERs and I feel I am ill-informed to talk about areas that need more protection. I am mostly focused on Africa and AIDS now, but local people will know what areas need to be protected. I have a lovely piece of property on Thetis Island and some of that is rare – could be protected as an ER – dry – juniper – mossy slope – very little soil – a rare habitat, and as far as I know very little protected. No we do not have enough ERs. It needs a citizen’s movement to protect them. I am inspired by the Stand Up against Wall Street initiatives that we have had. I am inspired when I see Ms. Morten walk through town with a trail of people that are concerned about fish farms. I am really inspired to see that people are getting together around ecological ideologies. MF I am wondering if there was a discussion or any insights into management of fire and insects in ER? What do you think is the appropriate level of management for ERs? PF. That is a really tough question. Whatever the level of management I think it is critical to have the research that goes with it. What we often have done on ERs around here is pull out the broom so that we allow the natural species the room that they need to grow. But when we pull out the broom we should be monitoring what we are doing – have transects and count the number of species per square meter or whatever we want to do – removing the invasive species from one island and not from another – whatever we can do to learn from what we are doing/managing. And if we have a big upsurge of native species when we remove the broom – I believe that has proven to be the case – then what we want to do is remove the broom. We want the endemics to be there. We want the habitats to be as close to the way it was before we interrupted it. But fire is another thing – fire occurs naturally – so I think we should encourage fire in certain areas – that would be the natural succession. So it is a case-by-case decision. MF I know that there are management plans and objectives for every ER but there is still disagreement when the management hits the grounds. PF. Introducing sea otters back onto the coast. We had a lot of objectors at that time but now we see the sea otters moving up the coast – we see the kelp beds again because the sea otter are feeding on the urchins that are wiping out the kelp beds – we see the benefits of doing things – managing ecology. We all learn by doing things. We have learned some of our best lessons by making huge mistakes. As long as we are aware of our mistakes we can learn from them. MF I want to ask what you think should be the emphasis for FER with the goals in our strategic plan. We have support for wardens, increasing science in ERs, completing or looking at the networks or the gaps and awareness of ER and sustaining a volunteer organization. Any thoughts on emphasis and what FER might do between those five? PF. Maybe liaison with government to help the wardens become involved with research. So when a researcher from UBC wants to go and work on the Spatsizi Plateau, maybe a warden could be an assistant to them. The warden’s knowledge is incredibly value to the researcher – so provide some funding to the warden – recognize the value of the wardens – train them. Setting up a system that would allow that to happen would be important – I am not exactly sure what that would look like but I think that is possible. There is a communications piece – finding out whom in government is responsible for this and that – always a moving target – who in the Universities you need to talk – perhaps more stability here. It seems such a shame to me to have these wonderful areas for research not really having high use by researchers. I think that would be the big piece. Another piece, and we have talked about this, is the placemats. They were so much fun to create – we often got together on Hornby Island to do our drawings and painting – then it would take another year to finish because there were always a bunch of grasses that no one wanted to do. I would end up doing those from the corner of my art table. We haven’t done a wetland placemat in our series – they could be available on-line as well. MF As a marine biologists can I suggest a marine islet one? PF. That is a great idea. Yes and get other people involved – it does not just have to be FERs – it would be good to get some of the people form Pearson College involved if you do a marine island one. The placemats are a wonderful learning tool and everyone who looks at them says these are the best. If I am going to look for things in the Garry Oak forest, this is the handiest thing I can use. We could change the format to something a bit smaller – that people could put in their back pocket. The funding for those seems to be easier than for research. MF I have touched on all the things I wanted to ask you are there some more you would like to add. PF. Ages ago we used to have an incredible speakers at our AGMs – back in the days. There was not IMAX theatre – but a wonderful Newcomb Auditorium. We held the AGM there – we got lots of people coming – I don’t know how FER can nurture that again. Maybe by working with the Museum you can get a talk about the ERs – Kind of like the CBC Massey lectures. Maybe that is a little pie in the sky but something similar to that. Have this incredible speaker that comes once a year and everyone knows that when they come to the Friends talk they learn a lot about ERs and ecology. It would be great. MF These are wonderful ideas and Peggy thank you so much. Are there more things that you would like to say don’t like me stop you. PF. The most important thing is to be on the ground – the wardens are the ones that are on the ground. I think supporting the wardens is really important. ERs are wonderful – we have an incredible network of ERs – we could talk to other countries that have ER – it would be interesting but until we have the ERs protected, they are not that valuable.